Chances are you’ve heard of The Da Vinci Code, a pop novel by Dan Brown in which a hero and heroine search for hidden clues at historic sites while being chased by a homicidal albino. Even if you haven’t read the book or seen the film, you can still star in your own Tartu mystery tour, a little adventure we’ve dubbed ‘The Adolphus Code’. Named for a man who played a pivotal role in the city’s history (as explained below), this 1.5 – 2-hour walking journey will take you through the most interesting parts of the town. The tour comes in the form of a puzzle – at each location you’ll find clues that point to the next destination on the trail. 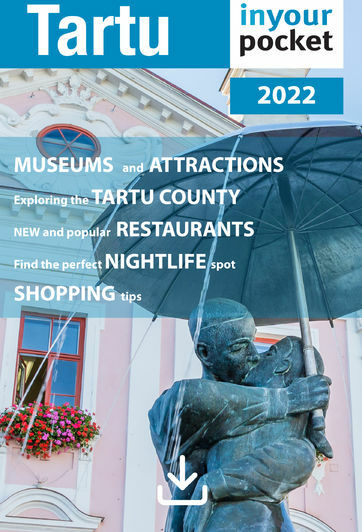 Along the way, you’ll find a few hidden corners of the downtown area and learn some odd tidbits about Tartu history. Don’t worry, the code isn’t too difficult to crack, and it’s unlikely that any albinos will kill you. 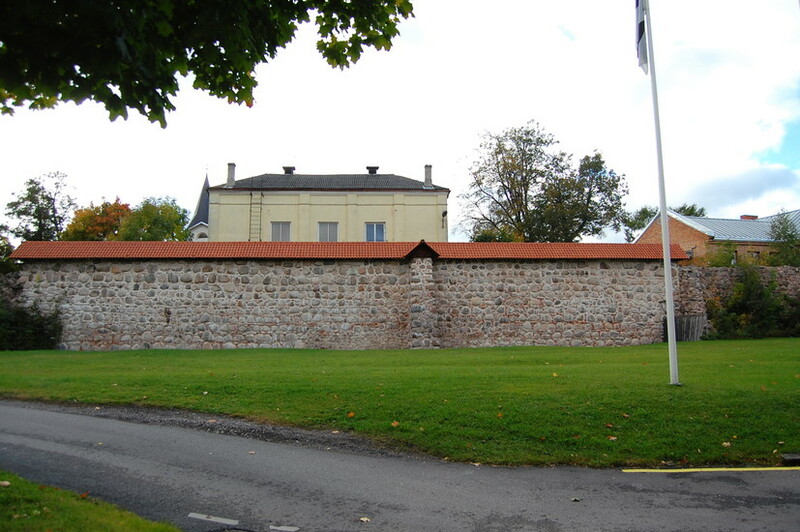 Your adventure begins at a very old site - the last visible section of the Tartu’s medieval town wall, a defensive system that once measured 2km and included 27 towers. Find it adjacent Lai tänav in a courtyard between Magasini tn. and Vabaduse pst. (B-1 on guide’s map). It should look quite a bit like the photo in the end of this chapter. At the right end of the wall, you’ll see a newer section of fence. Stand with your back to it, measure out 21 paces and turn around to face the wall. From this position should see a golden bird. The building on top of which the bird roosts is your next destination. On your way to this location, try to take scenic Jaani tänav. Along it you’ll notice that the buildings look older than most in the rest of Old Town – this was the only area of old Tartu spared by the Great Fire of 1775. 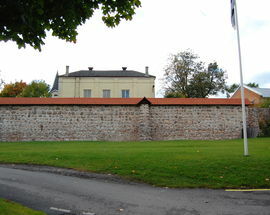 Now you should be standing at an imposing, brick building that’s a much-loved symbol of Tartu. Though it was first mentioned in records in 1323, archeological evidence suggests that it’s much older, possibly the oldest one of these in the country, even predating Estonia’s Christianisation. The building was left in ruins by World War II, and reopened only in 2005 after about 14 years of renovation. The 1000 terracotta figures for which it’s famous are gradually being recreated and replaced. When it’s open, you can visit the interior via a small door on the building’s south side. At this location though, your task is to find the large, main portal on the west end of the structure. Stand facing it from the street. From here your journey continues down this very street, either to the left or the right. A figure slyly placed above the doorway will use his sword to show you which way. Before leaving here however, you must pick up one more clue: As you face the main portal, you’ll see rows of tiny faces extending outward in two long lines from either side of the triangle above it. Count their total number and divide by three. Now head down the street directly behind you and find the corresponding house number. The symbol of the playful institution that stands here is a certain animal. Remember the name of that animal – you’ll need it later. From this spot, you can duck into the buildings and courtyard opposite to watch various types of traditional crafts being made. Returning from this little detour, continue down the street as indicated by the man with the sword. Beware of dragons stalking you from the rooftops. Stick to the left side of the street and begin counting antique street lamps as you go. After the fourth lamp, if you’ve chosen the correct direction, you should be able to look through a wall and see a tall, green man walking the same way. Read the placard next to him to find out who he was and how he fits into the nation’s history. Once you reach the fifth lamp, turn to look across the street. Here stands the main building of Tartu’s most famous institution, founded in 1632 by Swedish King Gustavus Adolphus II, this code’s namesake. The building itself is a later creation, dating to 1809. Its architect, a member of the highly secret Order of Adolphus, has hidden a clue in the gold Latin inscription on the building’s face. Careful historic research has revealed that, to the ancient residents of Tartu, the numbers 7, 9, 13, 15, 16, and 17 were the most sacred. Apply these numbers to the Latin text. They will tell you what object, hidden behind the building to the right, will be your next destination. Here he is, the revered man himself! The scroll he holds in his hand may indeed represent the original draft of the Adolphus Code. With that hand, he points to spot on ground. Draw an imaginary line from his feet to that spot, then follow it onward. Eventually it will show you what steps you must take to continue your journey. If you’ve done everything correctly, you should be at one of the most sacred spots in Tartu. Here you’ll find ruins of a 13th-century cathedral. Walk around it clockwise for a better view. In summer, you can also climb its towers. After making your circuit, you’ll be at an open area where you’ll see what’s called the Kissing Hill, at the base of which stands an ancient stone. This is where ancient Estonians once made bloodless sacrifices, and continuing the tradition, Tartu University students burn their lecture notes here after exams. 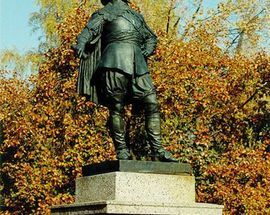 The area is also home to several monuments representing revered Tartu figures. Your task is to find a bookish man whose surname is remarkably similar to the animal clue you picked up in Chapter 2. He was the founder of modern embryology and his statue gets washed with champagne during each spring’s Student Days. When facing the monument, you’ll see what look like seven ears of corn. The middle one leans toward the path you must take from here. This stretch of road is a long one, so before heading off, you might want to take some refreshment at the roundly-named café on your right. It’s curious to note that this section of town is famous for being inhabited by an angel and a devil. As you make your way, your path will be that of the virtuous …but you’ll cross that bridge when you come to it. Now your trail veers to the left, toward a building that flies the flag of the republic. Just after you turn, you’ll see an excellent place to view the city. You should be warned, however, that you’re standing on top of a powder-keg …or at least you would have been a couple of centuries ago. A brick structure buried in the hill directly under your feet was once where the town kept its gunpowder stores. Now it’s a famous restaurant and pub, which you can visit later if you have time. Cross in front of that yellow, flag-topped building. This, by the way, is the only institution in Estonia that keeps its flag flying day and night. It was from here that stars were observed in the 19th Century, and it once boasted the world’s most powerful telescope. Continue around the building, and stay on the main path until it reaches its final end, then go where gravity leads you. If you’ve done everything correctly, you should come to one of the wildest restaurant/pubs in Tartu. Where do you go from here? Let the mythical griffon (part lion, part eagle) point the way. Before leaving you can stop for a beer or a snack, or at least to have your photo taken with the two famous wild men who hang out by the door. Now your path should take you between monuments dedicated to two generals. 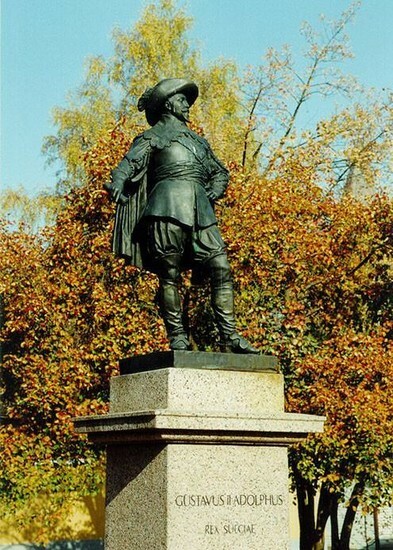 On your right, a statue and square named for a general who fought for Russia in the Napoleonic Wars. Across from it on the left stands a hotel with the same general’s name. Ironically the plaque next to its front door notes that a famous Chechen general (and later president) worked in this building in the 1980s. By now it may be getting a bit late. What time is it anyway? Luckily your next clue is a clock. The famous building on which you’ll find it was completed in 1789. That timepiece you’ve found is beautiful, but it isn’t unique – it has a twin on the same building. Find it and you’ll have found your next target. If you’re facing that second timepiece, you should be very near a rather wet monument which portrays two students doing something students like to do best (hint: it’s not studying). 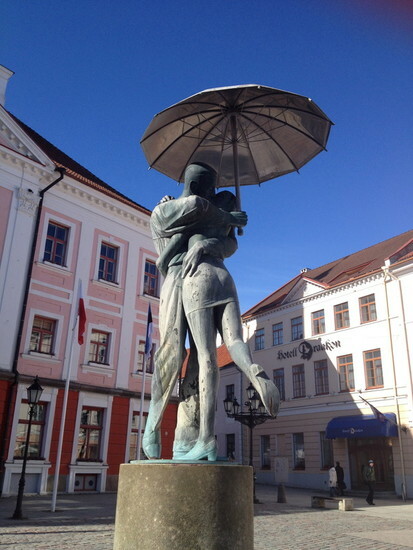 Designed by Mati Karmin and installed in 1998, this figure has become a symbol of the town. When this monument was placed, members of the Order of Adolphus positioned it so that the heel of the woman’s shoe points to your next clue: a building on whose face you’ll find a row of symbols that were highly revered in Soviet times. The Soviet symbols might look out of place on this otherwise neoclassical area, but are explained by the fact that this side was bombed during World War II, and replaced during Stalin’s time. Directly under the middle of those Soviet symbols is a certain word. It’s the key to finding your final destination. Head to the row of buildings directly opposite, and make your way to the right, examining each doorway as you go. Above the correct doorway, you’ll see the magic word, though it won’t be alone. Once you’ve found your doorway, take a few steps back and look at the building. Notice anything odd? That particular effect was created over the centuries, a result of part of the structure’s foundations being built on the softer earth of the river bank and part being built on the old town wall which, strangely enough, is the same town wall where our journey began. Congratulations! If you’ve gotten this far, you’ve successfully cracked the Adolphus Code and reached a treasure trove …of art anyway. In celebration, you should definitely reward yourself by visiting one of the nearby cafés to have a beer, eat some chocolates, or indulge in whatever treat you prefer. For more detailed and less cryptic information on the major sights you’ve come across during your little adventure, read the listings in the previous section of the guide.